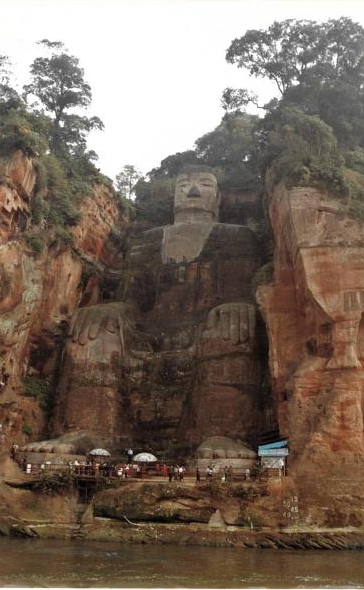 Travels in China: In Leshan, you can take a ferry across the river to see the Grand Buddha or DaFo. “The ferry rules were posted at the dock. Most thought provoking were: ‘Don’t set sail for the boats that are broken or have no complete driving instruments’ and ‘Keep the deformed, sick and drunk crew off driving boat.’ We departed the ferry at the bottom of a path leading upward to the top of the Da Fo steps. 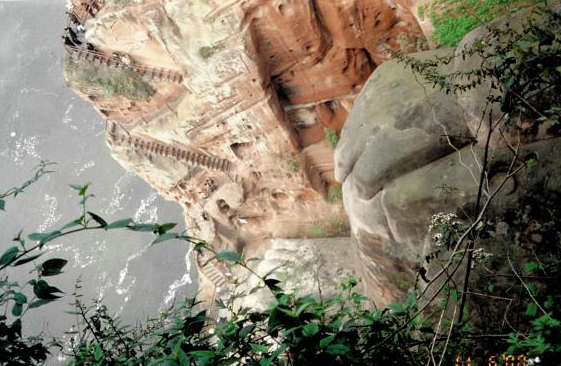 This Buddha sat on the side of a cliff by the river. Along the path was a dragon in a perpetual shower. The way its paws pushed out of the rock made it look like it was enjoying the shower. 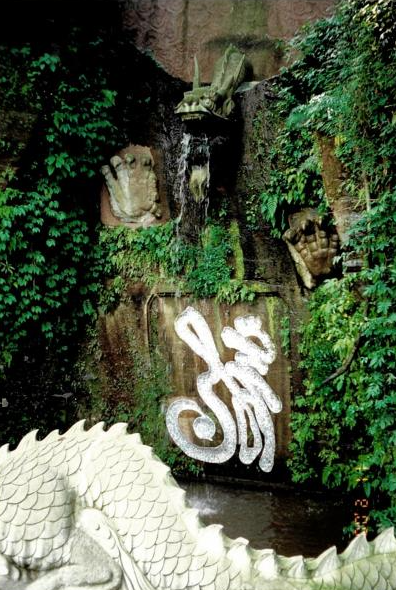 This was my favorite of all the dragons I encountered in China and there were many. At the top of the path, you were on level with the Da Fo head and his whole body was two hundred and thirty-three feet tall. I was distracted from the head by the other people milling around at the top of the path. People were buying caged birds to set them free. People were buying padlocks to fasten onto one of the many nearby ropes and then throw away the key. 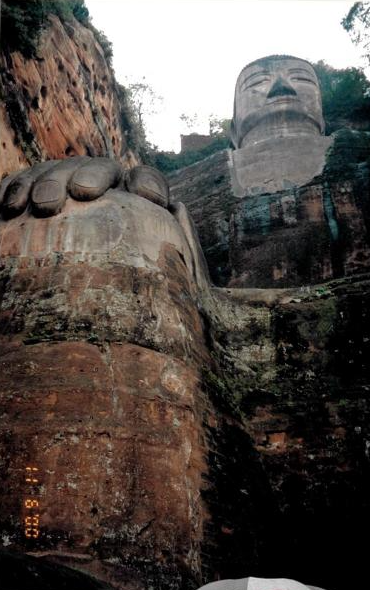 As it was a Buddha, it was a worshipping spot for many so these acts probably had some religious significance. You could walk down the steps. Thankfully, there were railings. 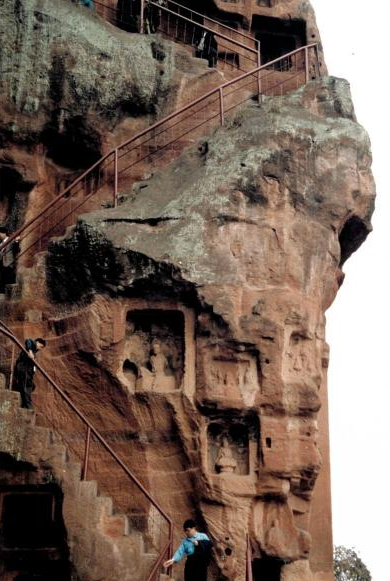 As if to admire the shrines, you could pause to catch your breath on the way up! 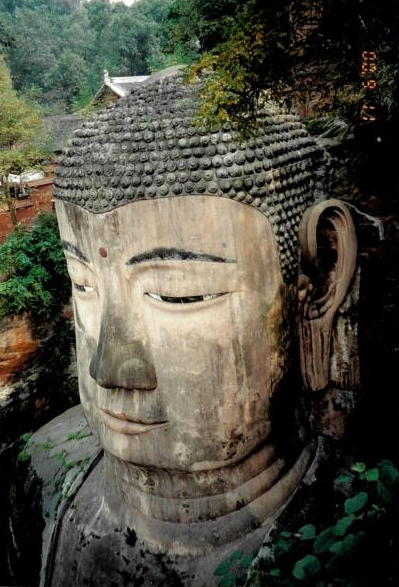 Looking back at the Buddha’s face, I realized that I was smaller than its ear and its face looked grim.